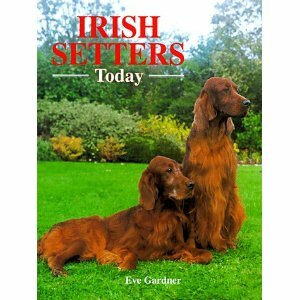 Irish Setter Dogs - Beautiful Companions For Active Families. Irish Setter dogs were developed in the early 18th century, though their roots can be traced back as far as the 15th century. They are believed to be a cross between pointers, setters and spaniels and have the abilities of all these breeds. Early on in their development, they were trained to accompany Irish sportsmen in finding game birds. They did this rather well and had a unique way of indicating to the hunter that they had located the quarry - by lying down. They are very quick dogs with abundant energy and can work in all terrains and climate conditions. There is no denying the striking beauty of this breed. Two presidents were owners of Irish Setter dogs - Harry Truman and Richard Nixon, as well as other celebrities which caused an upsurge in their popularity during those times. Many owners have fallen for the panache and handsome appearance of Irish Setter dogs without considering if they can match the activity level of the breed, which is a top consideration in owning one successfully. Irish Setter dogs are noted for their fun loving and affectionate nature. They are intelligence dogs with a bit of independence in their bones. Because of the need for a substantial amount of exercise, training for field trials is an ideal way to spark the breed's interest and take advantage of their natural abilities. This in turn can be a help in building cooperation for other forms of training, which is more successfully done when using a loving, yet firm and consistent approach. As family companions, Irish Setter dogs are amusing and mischievous, love company and get along well with other dogs. They are very people oriented and don't like being left alone. Behavior problems may result if they are left too often or for long periods. Although not of guarding instincts, this breed is alert and will sound the arrival of any visitors to your home and would also be protective if necessary. The Irish Setter has a silky coat that is mostly of medium length except for the forelegs and head where it is shorter. It has significant feathering around the ears, chest, tail, undercarriage and legs. Daily brushing is needed to keep this beautiful coat in good condition, free of mats and to control seasonal shedding. Excess hair around the ears should be trimmed for air circulation which will help prevent the tendency for ear infections. To be well adjusted, the Irish needs a lot of exercise. Without it, he will become restless and high strung and will not be an enjoyable pet. An active family is perfect for this breed. He makes an ideal and willing buddy for running or jogging, if you are so inclined. Otherwise, daily long walks and an opportunity to play in a fenced yard will meet his needs. The Irish does best in a rural setting with plenty of space to stretch his long legs and play. Secure fencing is recommended as he will tend to roam out of his territory if unrestricted. And strangely enough, even though he has a good nose - he won't necessarily find his way home! Apartment style living is definitely not his bag. This breed has an excellent reputation with children, but adult supervision is always recommended in these interactions as would be the case with any breed of dog. 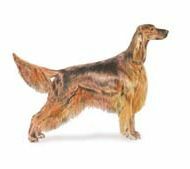 Due to the exercise requirements, Irish Setter dogs would not be the best choice of companion for the elderly unless there is someone else available to consistently meet those needs. An active dog such as the Irish Setter will thrive and be more able to ward off disease with sound nutrition. He will also thank you for more tasty mealtimes! 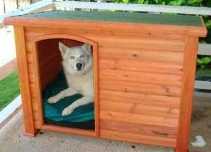 Shop Dog Houses At Amazon Today!